This type of water heater usually delivers water through a swivel spout or a single tap outlet. This type of water heater is normally flueless so continuous use MUST NOT exceed 5 minutes or a flue MUST be fitted. Of a Flueless design so takes air from the room and emits products of combustion directly into the room. Room volume is very important. Maximum net input 11kW. Water flow rate is approximately 2.2 litres per minute@55ºC temperature rise and only intended to serve one sink or basin. Designed to supply hot water to bath or a number of draw-off. These are room-sealed appliances (requires no ventilation) in common use, usually requiring 22mm gas supply pipe, giving continuous hot water to various taps. They are totally independent of any central heating system so can be fitted in homes without central heating. They can also be used to give instant hot water with any other type of heating. 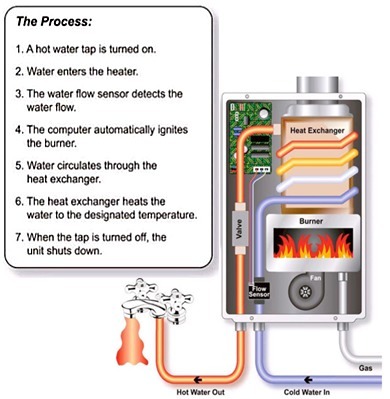 When a hot tap is turned on, the burner fires heating the water and delivering it at about 8-10 litres/min (dependent on incoming water supply) for as long as the tap remains open. Although several taps, showers etc, can be supplied, realistically water can only adequately flow from one draw off point at a time. Most instant water heaters do not require any electrical connection and require no hot water storage facility. Water flow rate is approximately 5.8 litres per minute at 55ºC to 9 litres per minute at 36 ºC.